Lovebugs: You couldn't even put your hand on the deck without touching one. Life on a boat can be incredibly idyllic at times. There is nothing better than sitting on our cockpit sipping our morning coffee or sharing a glass of wine at the end of the day as we watch harbor life unfold or close down for the night. There are times, however, when I find myself longing for a land based home. And while sometimes this can occur when there are nonstop high winds rocking the boat or when it seems that the rain will never stop, when I really start pining for more protection from the elements are those times when our uninvited guests start showing up. This year it was the lovebugs who were the first to appear. 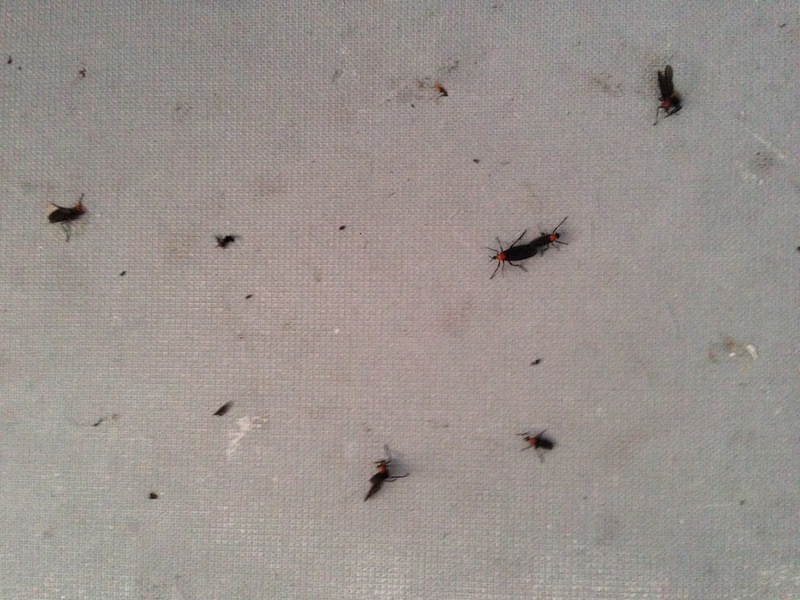 Contrary to the name, these little nuisances are actually little flies related to gnats. And, contrary to their name, they are hard to love. While they only appear during their mating season and they leave fairly quickly, they make themselves hard to ignore if you happen to spend any time at all outside. They remind me of lightning bugs, except you never see just one - they only seem to appear in duplicate, since they are mating. So when they land on you, your body becomes the equivalent of a hotel being rented by the hour. This year they appeared by the thousands - and that's just on my boat. I kept hearing from locals that they could not remember ever seeing them this bad. Everywhere you looked there were remnants of their presence. I wrongly thought that once we got out into the open water they would begin to trail off of the cockpit, where they had managed to make our white cockpit appear as if it was flecked with black paint everywhere. I found out later they are particularly fond of white surfaces. And I found out that they were not going to simply trail off just because we were no longer near land. Instead, when we tried to go out sailing, they invited their friends to join them. So by the time we were putting our sail up and I was at the helm, I was covered with "mating" lovebugs - which to me feels like being covered in flies. Oh wait, that's exactly what is happening! Unable to quietly tolerate this invasion of my personal space, I instead began stomping my feet and waving my arms in an effort to disengage them from my clothing, arms and legs. There may also have been some yelling involved. Unfortunately, this was happening when I was supposed to be keeping the boat headed into the wind while I was at the helm - which made it somewhat challenging for Stan to put the sail up. At one point, when he looked back to see why I kept veering the boat off track and saw all of my flailing about, he assumed there was an emergency occurring. And he was right. It was a lovebug emergency. But we survived that initial invasion. Plus, I discovered they really didn't like the smell of lemons, so once we returned to dock, I generously doused the dockpit with a concoction I found at Ace, and so that managed to thin their numbers pretty dramatically. Which brings me to our next uninvited guests of the season. And it always seems to me that they appear overnight. Suddenly everywhere I look in the water, there are these big white blobs bobbing in the water. That's right, the next time we were on the boat was the height of the jellyfish season. It was also the first time this season that we needed to use our marine air conditioner at night. The way a marine air conditioner works is that it pulls water from the bay to cool the air conditioner. That means there is an opening at the bottom of the boat for the water to come in, which then goes through a strainer that is accessible from inside the bilge in case debris get caught in it. Or, in the case of life in Aransas Bay, jelly fish. The first night we had the air conditioner on, about every hour the compressor would suddenly click off. That signaled for someone to get up out of bed, and kneel on the floor in order to open up the hatch to the bilge. That someone was Stan (don't judge me). He would then use pliers to unscrew the air tight top of the strainer in order to pull out the jelly fish that had somehow managed to squeeze its body through the 1/4" slits in the opening at the bottom of the boat before getting stopped at the strainer. Once the jellyfish made it that far, the supply of water to the air conditioner would be stopped, thus shutting down the compressor. After a few hours of this cycle, we gave up and opened the ports and hatches. This brings me to the third and final invasion - at least so far this season. Did I remember to mention that it was also the height of the mosquito season? We quickly were reminded of that when we had to open the ports and hatches after giving up on the air conditioner - and remembered that not all of our ports had screens on them - and none of the overhead hatches. But that really wasn't important, since it began to rain and so that meant the ports and hatches needed to be tightened shut. No air conditioning, and an airtight boat on a stuffy night. OK, so now you know. Life on a boat is not always idyllic. And, as wonderful as it can be on the boat when it isn't lovebug, jellyfish, or mosquito season, I do find myself dreaming about what it would be like to enjoy Rockport without these uninvited guests playing quite as much of a starring role. Thankfully, at some point that dream will be a reality, since we are still working on getting a small house built in Rockport. The building process, however, has turned out to be filled with many wrong turns, detours, and dead ends. But that's a story for another day. I suppose one benefit of these occasional flying and swimming invaders is that it strengthens my resolve to have the option of a home to flea to during those times. In the meantime, I am looking forward to enjoying the cooler than normal temperatures and the end of the rain. And hopefully, no new uninvited guests for a while. Vicki and husband, ceramic artist Stan Irvin, are both retired professors who have discovered the joys of Rockport and living part-time on their 33' sailboat, while exploring new sailing destinations and adventures.